Members of the Co-operatives of Innovative Intellectuals and invited guests attended the third annual Innovation and Breakthrough Forum to hear former US vice president Al Gore deliver a keynote address on the subject of sustainable innovation. 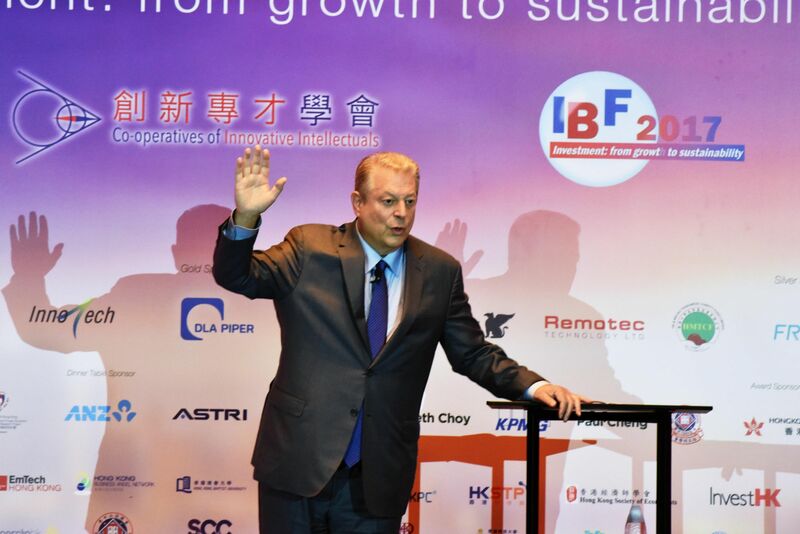 Mr Gore touched on everything from the birth of the Internet to Donald Trump’s tweets in a rousing speech that implored Hong Kongers to protect the territory’s “beautiful” natural environment. Following the conference, the Nobel Peace Prize laureate was guest of honour at the evening’s gala dinner. "Don't get me started on Trump's tweets," said former US vice president Al Gore in a spirited speech that had the room on its feet. Al Gore with Ian Huang, chairman of the Co-operatives of Innovative Intellectuals, the organisation behind the forum, and noted network engineer Dr Radia Perlman, an inductee of the US National Inventors Hall of Fame. Ming-yam Wong, chairman of Hong Kong Applied Science and Technology Research Institute (ASTRI); Ian Huang, chairman of Co-operatives of Innovative Intellectuals; Dr Frank Tong, global head of innovation and strategic investments at HSBC; Dr Meikei Ieong, chief technology officer at ASTRI. Dr Robert Lai, deputy secretary-general of the Belt and Road Global Development Alliance; Kevin Steel, partner at Robertsons Solicitors; Ian Huang, chairman of Co-operatives of Innovative Intellectuals; Wendy Yung, executive director of Hong Kong Wireless Technology Industry Association. Herman Lam, CEO of Cyberport Management; Dr George Lam, chairman of Cyberport; Ming-yam Wong, chairman of ASTRI; Maria Lam, chief corporate development officer of Cyberport; Dr Meikei Ieong, chief technology officer of ASTRI.